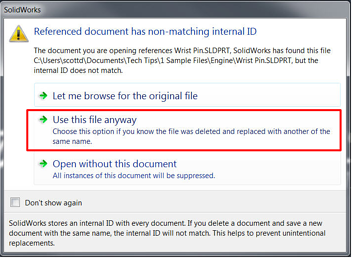 Have you ever referenced a SOLIDWORKS file only to be plagued with internal ID errors due to file name changes or parts with the same file name? 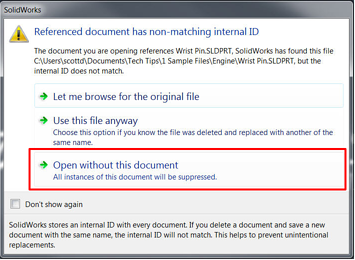 When opening assemblies, users sometimes get a message saying the referenced document has a non-matching internal ID. Let's explore why this occurs and how to remedy the issue. 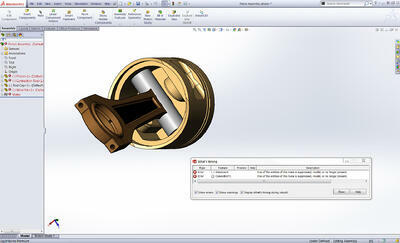 The internal ID is a number that is automatically generated and assigned to any part you create in SOLIDWORKS. This is not viewable or changable by the user. Once created, the internal ID will remain the same throughout the life of that part. If you rename the part, the internal ID will remain the same. 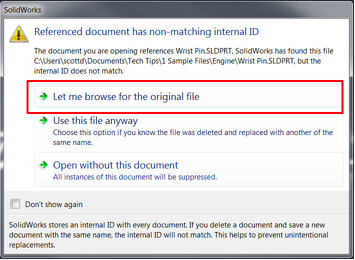 If you create a copy of the part and give it a different name, both files will have the same internal ID. If two files have non-matching internal IDs, it means they have the same name but different internal IDs. This means they were created independently of each other and are most likely not identical files. Still confused? Here's an example. When Part B is created from Part A, both parts will have the same Internal ID. Also, Parts A and B will share the exact same topology. This means swapping A out for B in an assembly typically goes much smoother because the face names (topology) match up. 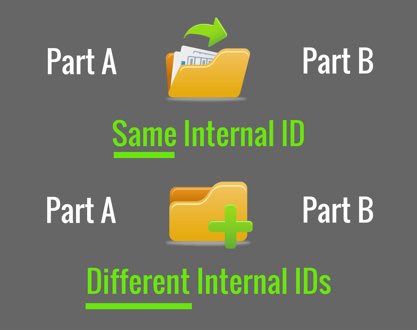 When Part B is created independently from Part A, they will have different internal IDs. Unless the files are purposefully built identically, they will most likely not share the same topology. For instance, one may be started on the front plane while the other may be started on the right plane. The resulting solid geometry may be identical, but the part topology is different. Swapping A out for B in this instance will likely require the mates to be reworked in the assembly. When you open an assembly and it informs you the internal IDs are different, you must decide whether this is the correct part or not. Fix #1: Is the referenced file in the correct location? Is the path shown in the dialog the expected location for this file? If not, select "Let me browse for the original file" and select the correct file. You may also want to determine why you have multiple versions of the same part number in the vault. Fix #2: If the file is in the correct location, was the file replaced with a more current file? If so, click "Use this file anyway" and the assembly will open with the file. Check the mates for the part to make sure they are correct. In most cases, they will not be unless the files were created identically on purpose. Fix #3: At this stage, depending on how the parts were created, the assembly may blow up. If it does blow up, close the assembly without saving. Reopen the assembly, and when prompted to use the file or not, select the "Open without this document" option. Once the assembly is open, you can delete the suppressed part from the tree and add it back in using the Insert Components dialog. After opening the assembly with the correct part, you will need to save the assembly to update the file references. Once the assembly is saved with the new part it should recognize the internal ID from then on. Want to learn more SOLIDWORKS Tips and Tricks? Subscribe to weekly Video Tech Tips!